Author Blake Butler took a scalpel to his name and removed the vowels. As a result, the cover of Sky Saw, his latest release, read: BLK BTLR. That was the first indication that I was in for a treat. Then came the madness, the unnerving prose, the dark visions, the portions of the book with unnumbered pages, the shifting points of view. By the time I finished reading the book, only two things were clear: Butler is very comfortable inside the genre he has created, and reading his work might cause visions not for the weak of heart. Sky Saw is full of nasty things. Bodily fluids saturate the pages and birds fly out of places where birds should not be. There is plenty of pain and suffering, and Butler’s prose brings it all to live with a strange mix of rich details and enigmatic imagery. His writing is always tense, bizarre, and pregnant with the promise of worse things to come. Enjoyable as this might be, the real surprise comes from the fact that the narrative is also infused with a poetry that shines even when describing heinous things. 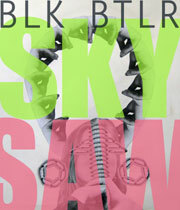 Not everyone will enjoy Sky Saw as much as I did. It’s a wonderfully uncomfortable read that sticks to your ribs and stays there for a while after you’ve turned the last page. However, everyone should read it. When it comes to Blake Butler, there are only two options: he’s either an extremely talented author dancing madly to the sound of his own poetic, obscure drum, or he is one of the finest con artists in contemporary literature. Regardless of which one is true, Sky Saw is a special object, a cultural artifact so far removed from everything else around that it deserves to be read even by those who won’t even attempt to understand it.